Sorry for the delay in sharing the photograph which I shot for day 25. It was a Saturday and we were still in Paris. Around lunchtime we were walking along St-Michel. Now if you have ever been to St-Michel you know it is filled with eateries serving food from all over the world with people touting for you to come in, a bit like what the Bangladeshi restaurants do in Brick Lane. Last time we were in Paris we ate there once. This time we did not want to do the tourist thing, so we were wondering what to do when we chanced upon ForgBurger. Though situated in a touristy place, the joint did not look touristy at all. We walked in and was greeted by a very friendly waiter. The place was comfortable and when we wondered in, it was practically empty. We chatted for a while with the young boy who was serving us. This time in Paris we met some really friendly souls. This is what my husband ordered, a skinny burger. He was super impressed with the beef patty, according to him, it was juicy & moist and done to absolute perfection! I ordered my usual chicken burger, it was also good, though I personally prefer a spicier piece of chicken. Loved the onion rings there and the chips were perfectly seasoned. Meals in Paris mostly do not disappoint. Neither did this. P.S. 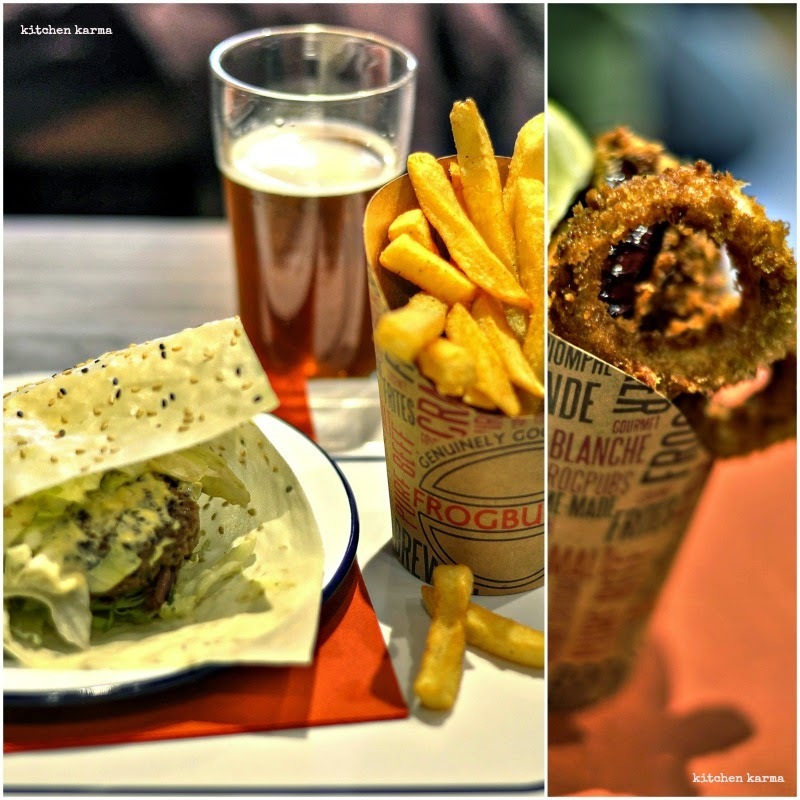 Burger joints, we know beef is your main ingredient and you try n number of things with them. But there are some people in the world like me who cannot enjoy beef. I am allergic to red meat in general and beef in particular. For the poor, deprived souls like us, can you please not try a few more variations to the chicken pieces you put into your burger?